Titled Shadow Budget 2013: Transforming Our Capabilities, the document highlights three main areas that would keep the Singaporean economy competitive and sustainable. Budget 2013, presented in Parliament by Finance Minister Tharman Shanmugaratnam on 25 February, does not tackle deep-seated and long-term problems that afflict the Singaporean society. For example, it does not address our over-dependence on cheap labour. Also, the Government continues to under spend on healthcare which puts Singaporeans in a difficult position facing massive medical bills should they meet with illnesses requiring hospitalisation. Thirdly, it is likely that measures aimed at managing high HDB prices will have limited impact. The SDP's Shadow Budget, on the other hand, addresses these problems and outlines transformative steps that would restore Singapore's comparative advantage as a small but resilient country. It would enact the Singaporeans First policy under which the government would implement a TalentTrack scheme. Potential foreign workers are vetted on a merit point-based system that would include factors such as age, skills and experience. The demand for such skills in the various industrial sectors would be provided by an Employment Visa Commission comprising ministries, employers, trade unions and professional organisations. This measure is described in detail in Housing A People: Sound Policies For a Secure Future. Only when skills match our economic demands and businesses demonstrate that locals cannot be found for the positions will foreign workers be recruited. Dr Wijeysingha also noted that the Shadow Budget will increase the Ministry of Health budget to $6 billion, on route to an eventual increase to $10 billion in line with developed nation standards. He noted that "the SDP sees increased health expenditure an investment in the well-being of the people and workers as well as expanding the healthcare job sector”. The funds will be placed in a newly set up National Health Investment Fund while Singaporeans will contribute an average of $500 individually (taken from their CPF), depending on one's income level. "Medisave will be scrapped and all healthcare expenditure will then be paid from this single-payer system, making it universal and affordable," Dr Wijeysingha added. The SDP Treasurer also outlined the Shadow Budget's initiatives to introduce the Non-Open Market (NOM) scheme for HDB flats. NOM flats will be built and sold at cost without land price factored in. This will make HDB flats affordable but owners will not be allowed to sell them in the open market for profit. "Flat owners who wish to continue in the open market may still opt to do so," he explained, adding that the formula gives Singaporeans who want cheaper HDB flats an added choice while allowing others to continue buying and selling their flats in the open market. Shadow Budget 2013: Transforming Our Capabilities (pdf) is available for download here. THE Singapore Democratic Party's shadow budget believes in the inherent trustworthiness of society and its people. Is this wise or misplaced faith? 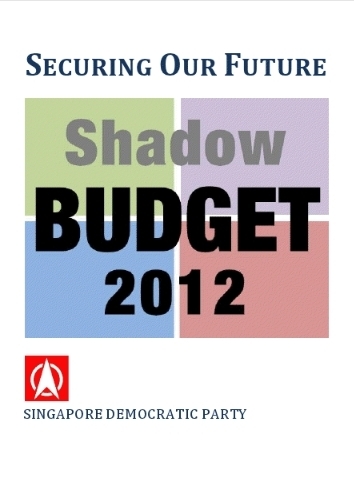 The Singapore Democrats will release our shadow budget tomorrow, 22 February 2012 at a press conference to be held at the party office at 12A Jalan Gelenggang at 4 pm. Members of the public are welcome to attend. We published Shadow Budget 2011 to highlight the deficiencies and misprioritization of our national expenditure by the PAP Government. This year's shadow budget, again led by Dr Vincent Wijeysingha, will again provide an alternative expenditure plan for our nation. SDP's response to Budget 2012: How can we trust the Government? This year will go down in history as the first time that Singapore's opposition has put up a Shadow Budget. The Singapore Democrats are proud of notching up another first. With Shadow Budget 2011: Empowering the Nation, we continue to push ourselves to attain the 3 Cs we have set for ourselves, that is, to be a competent, constructive and compassionate party. We do this in an earnest attempt to take politics in Singapore to a new level.